You know when a word just reaches out and touches you, unexpectedly and from nowhere. An immediate, connecting link is formed, a thread which binds to you that very word or expression which has suddenly landed in your soul. Recently, while preparing my New Year three word post and typing in my thoughts and words, I hesitated as I typed in “frangipani”. I love frangipani, the delicate fragrance, the vulnerability of its blossom, and the way it drops little gifted flower heads along the road for me to gather. 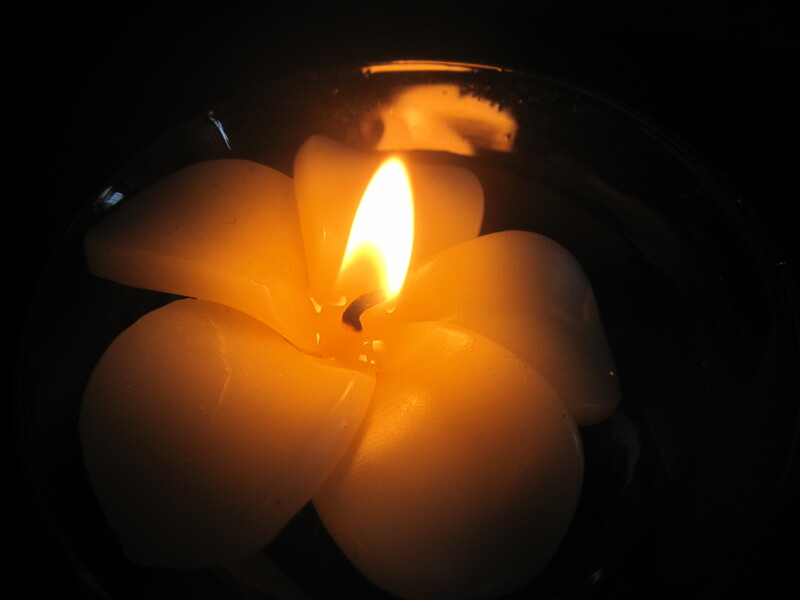 I paused for a moment, closing my eyes briefly to take in the thought, the imagined scent and the soft petals before starting to type … f – r – a – n – g – i– p – a – n –i……… . And as I continued committing my thoughts to electronic paper, my eyes were drawn back to the word on the page. Frangipani, shouted back at me with an angry, wavy red line underneath batting my precious flower back to me. “WRONG! No such word“, screamed the electronic literary masters. How bizarre? Has the spellnet not heard of frangipani? How can that be? Curiously, I right-clicked on the word to see if I had actually mis-spelled it. I was very surprised to see an unknown word suggested in its place. Frangible? I looked up from the screen, searching in all the dusty corners of my memory. What does frangible mean? And why do I not know what it means? The word immediately touched me and intrigued me. Frangibility, the noun, spoke to me of delicate strength. My curiosity pushed me to search further, to understand how it was used. And also perhaps to shed some light on why it was so unfamiliar to me. Delving deeper, I discovered that there is an element of intent in the term frangible, which is inconsistently revealed according to the various references. Apparently, frangibilty has a deal to do with design and protection. An item is frangible if it is designed with intent to break easily. A lighting pole may be frangible so that in the event that a vehicle strikes it, it will break and minimise harm and reduce impact. There are often frangible points built into structures, which can be broken in order to release smoke if there is a fire. Sigh. I thought my mind would have a rest for cancery stuff, but the inevitable link swam forward. The aggressive, destructive nature of treatment which breaks us as far as we can be broken, in order for us to have the chance to rebuild. My poor thyroid, which was clearly frangible, being obliterated as it was traded-off for chemo. Hair and nails, falling and shrivelling as they took the brunt of the impact. Healthy skin being scorched and destroyed by the rays of radiation. All by design, and all with the hope and intent of protecting my body from the advance of cancer cells. What a path we travel on. A path of many strands. Emotional, physical, medical, creative, intellectual…… And what discoveries we make along the way. From a new word, to a confirming realisation of our co-existing fragility and resilience. 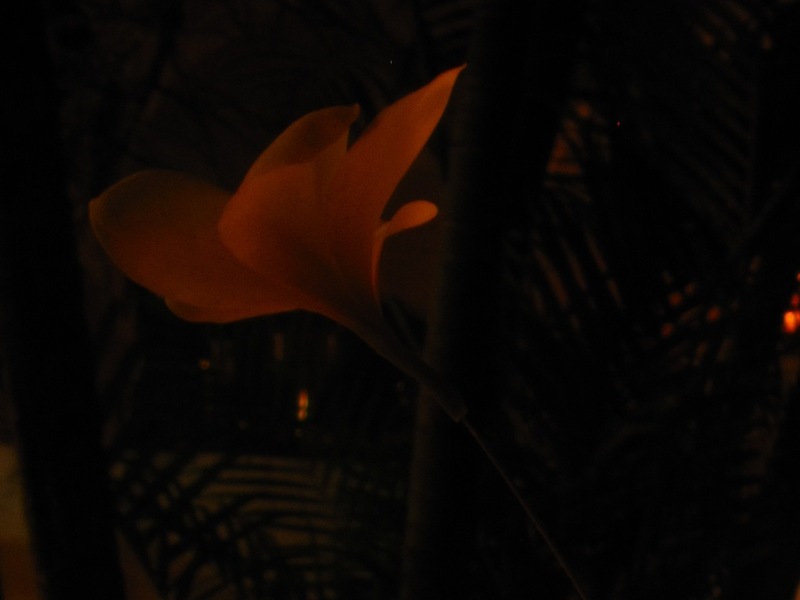 All thanks to a little frangipani blossom……. I have been remiss in caring for the bloglet, and with updating on news from my end. The last thing I remember, I was packing bags on January 2 and heading for Bangkok for the additional and scary review with Dr W2. Now it is January 13 and I am not sure what has been happening in between times. That is not entirely true, actually. Life has been happening. As soon as I arrived in Bangkok, I swung immediately into the “preparing for the tests” mindset with the gritted teeth and clenched knuckles that accompanies and characterises that tense time. I moved through the checks like an automaton and was spat out the other side in one day. Exhausted, numb and emotionally drained. The main things to check were the clottability factor due to the embolism and of course, the dreaded tumour markers. In a nutshell, I have been released back into the wide world again and will be reviewed again in another three months. The cloattability is pretty stable which is fine, although I do have that checked regularly in Yangon too so was not hugely concerned about that. It was the tumour marker which was stressing me. The important thing about the markers is the trend rather than the individual result, so it is important to see this over a period of time and a number of tests. I knew that a further increase would be the most worrying scenario and was very glad that although the markers are still above the reference range, they have decreased slightly. So now we just have to see how a trend plays out over the coming months, but I do have some reassurance and can breathe out for now. That gave me a day in Bangkok to do around a week’s worth of chores and tasks and before I knew it I was back at Bangkok airport waiting to board the return flight to Yangon, along with a number of friends and colleagues also returning after the seasonal break. I arrived home without incident, unpacked, ate, went to bed all set for the first day back after my break. And indeed, before very long the alarm woke me, I forced myself to get up in the pitch dark, put on my swimming stuff, and some warmer clothing and shake the dust off my bike in a return to my morning routine before work. The days have thus been full, with the early start in the cool (and now even cold) Yangon mornings and intense activity at work so my first weekend has been very welcome although it has brought quite a backlog with it. Hence a game of catch up and a need for bloggish housekeeping. While I was in Bangkok, I took advantage of the superfast internet and uploaded a few photos. I decided to change the background picture here, and decided eventually on this image. This is a photograph from my visit to Angkor (Siem Reap) in Cambodia last year, a wonderful adventure and a truly confidence building exercise. 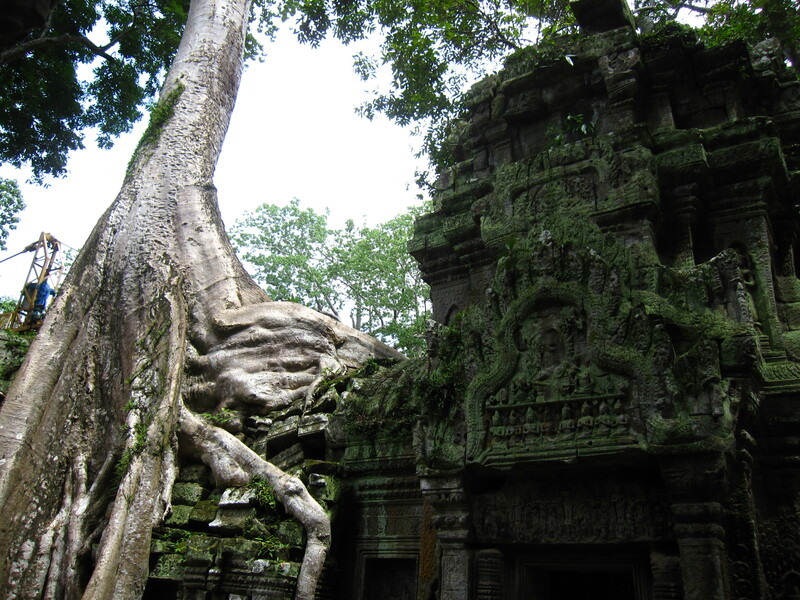 I loved the ruined temples, and especially the way nature and the temples have evolved with tree roots holding the structures together in some places and dividing them in others. I was continually struck and by the resultant impression of man-made and natural elements in complete fusion. As well as being a photograph I like, it has particular happy associations and that is how I would like to set the tone for the on my background. There are many more photographs on the sister (photography) blog. As we move into 2013, I remain enthused by my three word mantra (focus, treasure and design) and am embracing the coming year. I am taking the time to focus in on what I want to achieve and draw up clear goals for my year. And in a beautiful and unexpected gift I received from a friend and colleague, I have the perfect reminder. 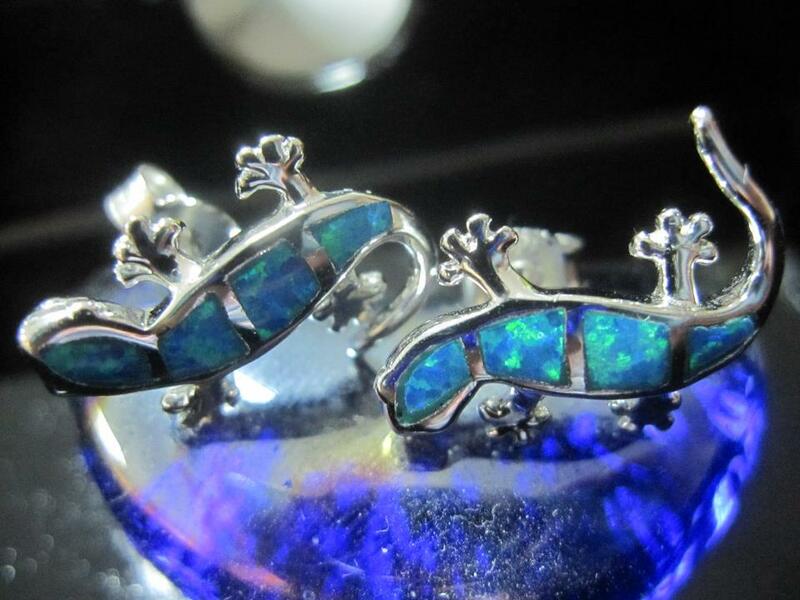 A pair of stunning Feisty Blue Gecko earrings, something to keep me focused, to treasure and of an intricate and precious design. So with a galloping account of hospital visits, early mornings, plans and goals, Cambodian temples and opal earrings, I trust that I am now getting back up to speed. What if I were to tell you, how scared I get. What if I were to tell you, I think about it every day. At least once. Though most days, so many times I lose count. What if I were to tell you, it doesn’t get better. Not really. Just different. What if I were to tell you, it makes me feel a hate so strong it stirs fear in my soul. Fear of my own hatred. What if I were to tell you, I will never be the same again. I know. What if I were to tell you, I wake in the night, wet tears reminding me. When I thought I had forgotten. What if I were to tell you, that every twinge, every hint of pain brings a sweeping new dread. What if I were to tell you, that hearing it is my fault ignites a fire of anger in my gut. What if I were to tell you, it is just not as simple as “moving on”. What if I were to tell you, that long after all around me have forgotten, it is my first waking thought. What if I were to tell you, that once you hear that word, the mirror shatters. The life you knew evaporates. Replaced by a parallel, silent, world. One built on assumptions. What if I were to tell you. And you were to hear me. This is now the fourth year which I have used the “three word” exercise instead of resolutions, to inspire the coming year and to use as a motivation for change. In fact, I really did not make resolutions before then. They did not hold much meaning for me. Of course, there were things I wanted to do or change, but I did not necessarily find that the New Year was timely, or adequate, for that. When I first saw the three word exercise, in the final hours of 2009, it instantly resonated with me. The timing was exquisite, coming after my diagnosis and in the midst of chemo. The words tumbled into my mind easily, singing encouragement and hope. They formed a mantra which truly enabled me to think forward, and explore what my priorities should be for the coming year as I moved through treatment and into a new unknown. It was motivational, affirming and inspiring. It is fascinating to look back and see, through these words, where I was emotionally and physically this time last year. 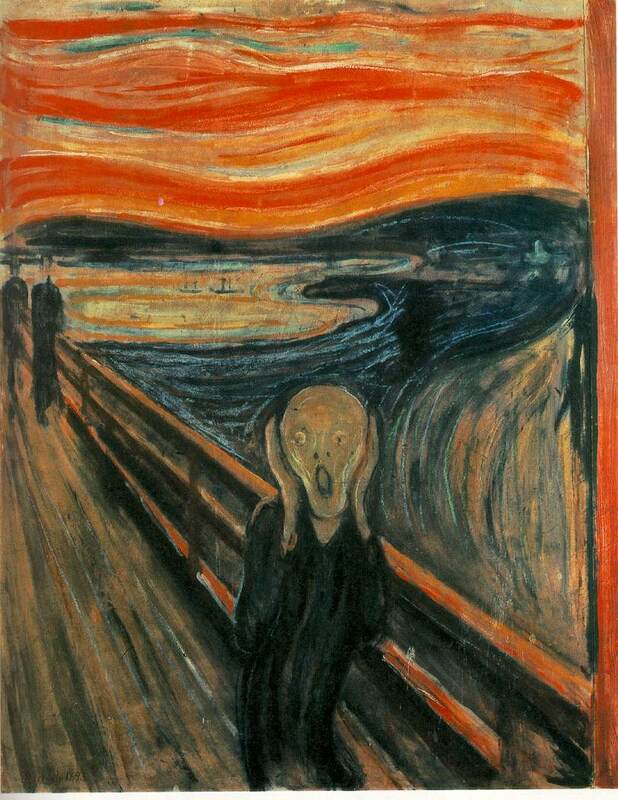 And to reflect back on how apt they might have been for 2012. In terms of resilience, oh my goodness that has been apt. It has been a reminder throughout the year to really focus on emotional and physical wellbeing in order to have reserves to draw on when needed. And how they have been needed. Serious health issues for me and close family members have led me to sink time and again into the bank of resilience and, I hope, have to a certain extent lessened the struggle. I am glad I also selected escapade. This has been a reminder to carpe that diem, and do things in the here and now. My pulmonary embolism in July, and the fright in October, with the bone scan and raised tumour markers reaffirmed how important it is to do the things I want to and not have regrets. These do not need to be Big Things, although trips to Hong Kong, Timor Leste, Indonesia, Cambodia and Norway are pretty big in the scheme of escapades! Just as valid have been those spontaneous and smaller escapades, such as cycling off down unknown paths with my fantabulous bike, or taking the circular railway around Yangon on Christmas Day. And as for wonder, this lives in my very soul. I am curious by nature, and my mind wanders off on trails of thought unbidden, leading me to fascinating destinations and passing through unexpected places. Watching a kingfisher at the poolside took me on an incredible journey of wonder in every sense. I know I need to hold on to that awe and appreciation in what is around me. I know that a healthy curiosity is critical to my psychological and emotional wellbeing. That is the way I rock and roll! Truly, these words have both guided me, serving as a reminder of priorities and also served to preserve the essence of what turned out to be a tough year for me. Last year I spent a great deal of time selecting the right three words for the year – “resilience, escapade and wonder”. And of course, just a few days into the New Year, I was already wondering if I had made the right choice. I am a bit of a butterfly and flit from task to task, from idea to new idea and am easily drawn away in unplanned directions. I remember thinking that I needed to focus, to see projects through after the novelty wears off and to set clear goals and objectives as well as commit to seeing a task through. I particularly like the fact that focus exists as a verb as well as a noun and thus expresses deliberate action as well as something tangible to aim for. It will remind me that I must focus on my health, on ensuring a balance between work and leisure even in such an exciting, changing and increasingly demanding environment. Ensuring focus will also help to bring clarity, in the literal as well as the figurative sense. Yes, focus is an important word to set the tone for my year. The second word has been a bit slippery! My earlier choices included nurture, nourish, cherish and embrace. With embrace, I wanted to capture that sense of not just accepting whatever comes my way, but moreover to grasp it fully and transform it into something positive and to my advantage. In my mind is the shadow of my January checks and the checking of the tumour markers. Whatever the tests and the future holds, I must own it. I must accept and take control of all that I can. Embrace had appealed in that it conveys a sense of acceptance with the added element of taking control. I had also been taken by nurture, with its essence of encouraging growth and creation through care. If I had to select just one word for the world, then it would be nurture. We need to nurture all around us, our children, our partners, parents and family, our colleagues, friends and acquaintances. We need to praise and encourage. Then I settled on “cherish” which is a beautiful, rich word. I felt that it conveyed all of the previous aspects, as well as a beautiful sense of when caring for the most precious things to us, protecting and treasuring them. And that is when “treasure” came rushing in from the wings and swept over cherish gently setting it to the side. Treasure has been my final selection because it has a wider range of meanings, which include cherish. I also love the fact that it is also a both a verb and a noun, and that symmetry really calls to me. In its verbal form, it is very close to cherish, with the added sense that it is something very special. I love treasure as a noun too, because we are surrounded by treasure, in even the most ordinary, everyday entity. 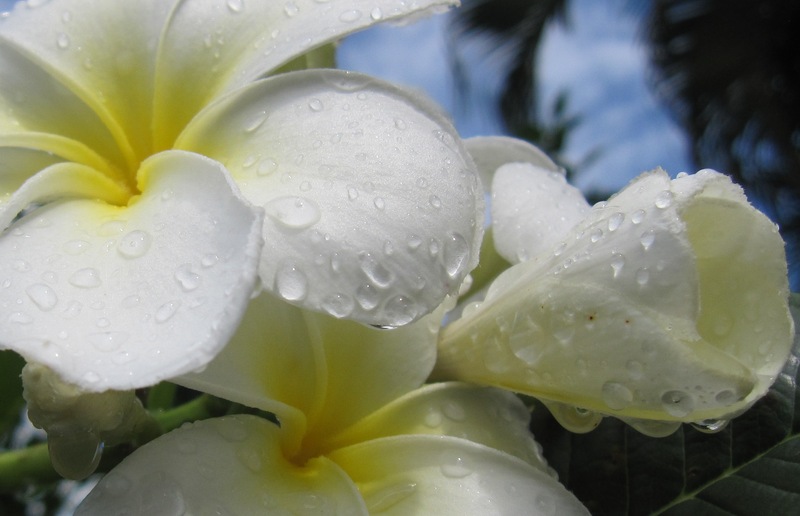 I love to pick fallen frangipani blossom in the morning, and call it morning treasure. As modern life becomes more sophisticated and complex, maintaining a sense of naivety and wonder is refreshing if not essential to our emotional well being. I also apply this concept to my physical well-being and know that I must continue to focus on health and activity. My wonderful morning swim and cycle routine is a treasure indeed. It is so important to notice the simplest elements in our surroundings and value them. We really are surrounded by treasures. My third word is design. Again it is a noun and a verb, and again it has a variety of meanings which speak to me for the coming year. It represents the importance of creativity in my life and serves to remind me to prioritise those creative activities which I so enjoy. I need to ensure that there is space for art, reading, writing and imagining, and that I must ensure balance in my life. Design also conveys a sense of deliberate action, as in the phrase “by design”. This chimes with me so much. No matter what challenges are thrown in my way, I must retain control and make wise decisions as I follow the path I choose. I must ensure that I invest effort and due consideration and don’t just allow myself to be swept along. Life is not about what happens to us, but how we deal with what happens to us, and we must remember that. So these are my three beautiful words, my mantra for 2013 and my guiding star. The past year has been tough in so many ways, and I hope for a year which is kinder. I know that the dark shadow of the oncology review is in the first days of 2013. I move towards that, holding tightly onto these words, trusting that no matter what this brings I will be guided through it.